Those who address conflict resulting from differing socio-economic groups (stratification systems) focus on the arousal of negative emotions. 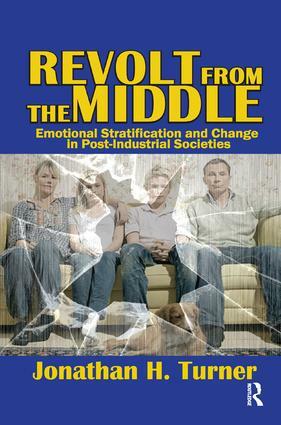 Less frequently explored are the effects of positive emotions, particularly among the middle classes in industrial and post-industrial societies. In more developed societies, those experiencing positive emotional energy far outnumber those who endure negative emotions. Jonathan H. Turner sees the distribution of positive and negative emotions in developed societies as another basis for grouping people into socio-economic classifications. Such distribution explains the commitments of middle classes to the system and the lack of class-based social movements from lower classes. Turner argues for Marx's theory-when a population's vast majority is consistently experiencing negative emotions, the potential for revolution within society increases. Turner explains why class-conflict potential is low in developed societies and how it might increase if the middle classes lose their share of resources. He notes the beginnings of this shift, but says that the overall positive emotions of the middle class have not yet transitioned from positive to negative. Capitalism will persist, but it will be a reformed capitalism, especially in the United States, as taxes and regulation by government assure higher levels of resource redistribution to members of a society.